victorious Sunday at Lambeau Field. The Minnesota Vikings are about to embark on one of the biggest games in recent seasons. A win improves our record to 7-5, a loss drops us to 6-6 and limits our postseason chances. Divisional games are huge, especially when they are against teams that are ahead of you. The Green Bay Packers are fresh off a 38-10 loss to the New York Giants last Sunday. The Vikings are also looking to bounce back after a tough 28-10 loss to the Chicago Bears. Which team will bounce back and make an attempt to better improve their playoff picture? It all will come down to five keys that the Vikings must accomplish to walk away victorious at Lambeau Field. 1) Control Time of Possession- our defense was on the field for nearly triple our offense last week and this was a big factor in the loss. As the game proceeded the Vikings defense began to become more tired which caused Chicago to pick us apart offensively. In addition, if you allow the Packers offense to be one the field the entire game, they will wear you down very quickly. 2) Pressure Aaron Rodgers- last week was one of the worst games I have witnessed our defensive line play in a long time. We allowed Cutler too much time and allowed him nearly 8 seconds to make a decision during several occasions. 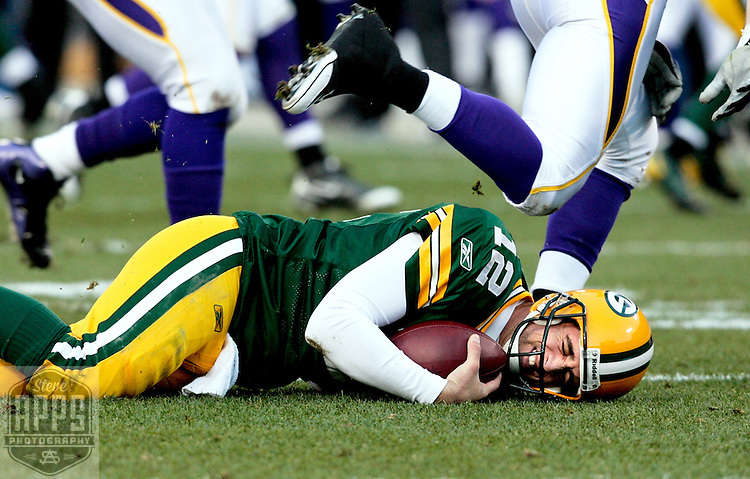 This definitely cannot happen today, as Aaron Rodgers will make excellent efforts to extend the play. 3) Establish the run with Adrian Peterson early- the Vikings were put into a difficult situation last week, when they were playing behind for nearly the entire game. We must control clock and pound the ball with Adrian Peterson. The Packers have a vulnerable run defense, but it won't matter if we don't get it started within the first quarter of the contest. 4) Hit the Tight Ends- Look for Kyle Rudolph to be targeted frequently in the early part of the game today. The Packers will be without Clay Matthews who would generally shade the tight end, so rookie Dezman Mozes will be a target. Rudolph has a great skill set and should be a point of emphasis in the redzone. 5) Utilize Jarius Wright- Offensive coordinator Bill Musgrave indicated he was establishing new plays to revolve strictly around Wright. This will be especially important with the absence of Percy Harvin for today's game. It won't be important if our receivers can't receive the ball like last week. With a plentiful amount of drops, the Vikings will be blown out by a Packers team that takes advantage of missed opportunities. Overall, these keys will help our chances to win a huge Northern Division Collision vs. one the Vikings most hated rivals. The all-time series between Green Bay is 53-48-1 favoring the Packers, but the Vikings have a 1-0 edge in the playoffs. In addition, the Packers have won 7 of the last 10 meetings between the two rivals. I have no predictions today because as Viking fans we know what needs to happen and the importance of today's game. Hopefully by 3:30 today our team will be 7-5 and injected with life going throughout the rest of the season. I will be proud of my Minnesota Vikings even with a loss and will know that we gave our best effort. Let's go Vikings fans! SKOL!!!!!!!!!!!!!!!!!!!!!! !